The longest walk: Rice and Palmer hold hands on the way to court. My mother taught me a basic moral imperative before I even entered Kindergarten: Unless you’re defending yourself from someone who continues to attack you, don’t hit people. 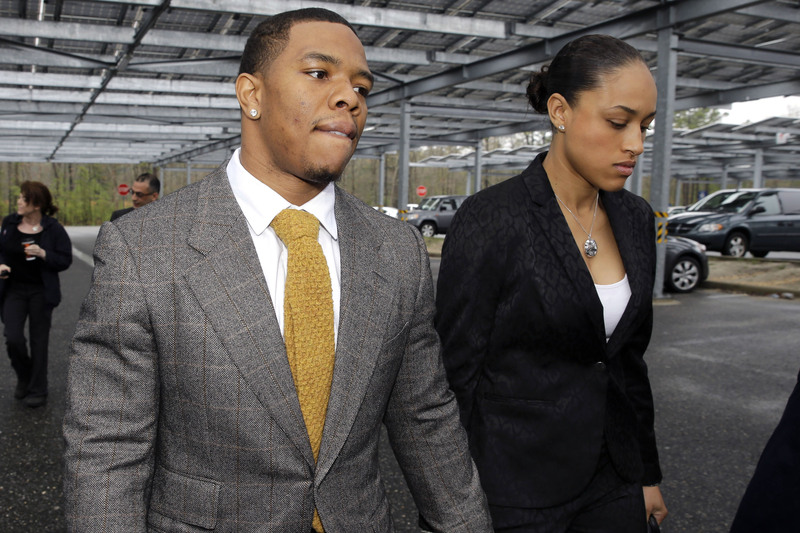 Having said that, it should be clear why I was appalled at Ray Rice’s behavior in the recently released casino footage. He not only hit his fiancée twice, but once she was out cold, he also dragged her and prodded her body with his foot the way one might handle a neighbor’s dead Golden Retriever. None of his actions were based in self-defense, and many were quick to point out his unjustified viciousness. I fully support this. I was struck, however, by the almost utter absence of condemnation for Janay Palmer, who is now his wife. She incontrovertibly engaged in physical violence with Rice that night, and she acknowledges it. Journalistic sources acknowledge it. It’s a matter of record. It’s there for anyone to see, and based on the basic moral principle I outlined above, I say her behavior is worthy of some outrage, too. My opponents disagree, and their dissent takes three major forms. First, there’s the argument of moral superiority. Some say that though they were both wrong, Rice was tremendously wrong, thus Palmer’s behavior doesn’t deserve much, if any, scrutiny. The problem with this thinking is that it sets a post hoc minimum threshold for moral indignation based on the relative severity of participants’ actions. In other words, do anything you’d like to do to another person; as long as the stench doesn’t reach a level to be determined later, and the other person’s foulness rises even higher than yours, we’ll look the other way. This is indefensible. We have the capacity to direct moral outrage at both participants in an altercation while simultaneously acknowledging that one participant may have acted worse than the other. Bigger wrongs don’t need to blind us to smaller ones. And speaking of size, it’s also wrongheaded to hold men to a higher moral standard than women just because men are generally capable of causing more harm. That’s the essence of the argument from physical relativism, and it basically states that bigger adults have a responsibility to act more ethically than smaller adults. A variation of this idea relies on the same fundamental assumption about the impact of size and gender to accuse me of blaming “the” victim. I categorically reject the notion of one victim here. Two people victimized each other, regardless of the fact that one’s savagery was more complete. Rice is larger than Palmer, and most men are stronger than most women. Unfortunately, self-control isn’t doled out in proportion to size and strength. At the same time, decreased potential to inflict as much harm as your adversary due to differences in stature, strength, or skill doesn’t negate accountability for your actions toward them. Solange deserved universal public humiliation for her attack on Jay-Z in that other infamous elevator incident, regardless of whether he was ever in any “real” danger; instead, Solange got a magazine cover and Jay-Z got mocked. While total physical equality between the sexes is a fantasy, total moral equality shouldn’t be. Men and women must be judged equally for the pain and suffering that they inflict or attempt to inflict upon each other. Finally, we come to the most dangerous argument against my rebuke of Palmer, and that’s the argument from moral necessity. The thinking goes something like this: Calls for disapproval of Janay Palmer are morally irresponsible since they shift the focus away from Rice’s actions and distract the public from the larger issue of male-on-female domestic violence. It’s an attractive point of view, and its allure flows from the appeal of its core truth: domestic violence is horrible, usually perpetrated by men toward women, and only a villain would derail efforts to eradicate it. But therein lies its perniciousness. I’m not obfuscating Rice’s guilt, nor am I painting Palmer in the worst possible light so as to diminish his foulness. I’m shining a light on the darkness of the entire situation, and I can do that without negating the sheer ugliness of what he did. Despite the fact that female-on-male violence almost assuredly happens much less frequently than its opposite, if a woman puts her hands on a man and she’s not in clear and present danger, she’s wrong. No amount of lamentation regarding the state of violence that women in the world endure can make the case against that any stronger. When a victim becomes a victimizer, it doesn’t negate their former status, it just adds more tragedy to their story. My stance is an utter refutation of domestic violence in all of its forms. We must condemn Rice, vividly illustrating why what he did was so far beyond the pale of acceptable behavior. Simultaneously, we should condemn Palmer in a manner proportional to what she did. Women need to know that physical weakness cannot be used as a shield or as a weapon when it comes to domestic violence incidents in which they’re perpetrators or participants. If we don’t do that, we’re sending mixed signals regarding our views on brutality, and that’s irresponsible.